Mandalas have a rich history as both spiritual and personal growth tools and as inspiring works of art. While they have been used historically as part of religious rituals to enhance spiritual growth, their current popularity often focuses on the innate beauty of these intricate designs and patterns. Mandala variations range from simple repeating geometric designs in bright colors to themed mandalas. Consider these common mandala themes when choosing mandalas for your artwork or craft projects. Geometric Mandalas: Geometric designs arranged in concentric circles are an attractive addition to home décor and can even be framed as a showpiece. These mandalas may include circles, stars, scrolls and hearts intertwined in a repeating pattern of both shape and color. The color scheme ranges from light pastels to give a fantasy look to the piece, to bold primary colors to add energy to the room or project. They can be color coordinated to fit the décor of the room or create a colorful accent to any room. Flower Mandalas: Flower mandalas range from concentric circles filled with a wide variety of tiny flowers in varying shapes, sizes and colors, typically arranged in a repeating pattern, to one complete flower with its varying parts, such a leaves, petals and stems, arranged in attractive designs. These mandalas can be used for seasonal décor or art work, laminated and used as placemats or as coloring patterns for children. Animal Mandalas: These mandalas may feature one animal or may contain a variety of animals within one design. They are ideal as a drawing project for young children when studying farm, zoo or safari animals as it give kids the opportunity to demonstrate their understanding of the concepts taught while enjoying the challenge of creating a unique design to display. Animal mandalas can also be used by adults as part of art or drawing projects. Consider animal mandalas with sea animals to complement a nautical theme or try baby animals to welcome spring. 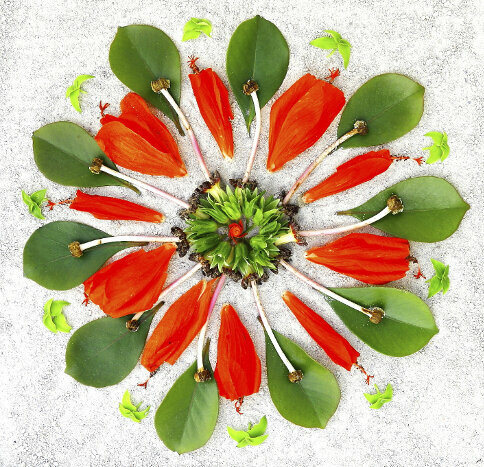 Nature Inspired Mandalas: Nature mandalas may include flowers, but are not limited to them. They may include cones, pods, seeds and a variety of other natural items. While nature mandalas can be drawn and colored, they can also be made into a 3-D art project. Consider using vines or hemp to create the outer circle of the mandala and fill it in with seeds, nuts, sea shell, petals of cones or any other natural items you find appealing. Mount the mandala on a solid background, such as foam board or wood, and display it on the wall or the front door. Hobby of Interest Themed Mandalas: Take advantage of your hobbies and favorite activities when creating your own mandala designs. Choose images that relate to your hobby, such as fishing gear and colorful fish for the fisherman, or the moon, sun and stars for those pursuing spiritual enlightenment. Incorporate them into your mandala design by creating a repeating pattern with the items. While traditional mandalas are often drawn on paper or posterboard, you can make them from any medium. Consider using mandalas in untraditional ways. Use fabric to create an applique or quilted design. You may want to start small by creating a simple wall hanging, but as your skill develops, you can easily make table runners, place mats, throws and even a full size quilt. Applique or quilted mandalas are also used to enhance the appearance of tote bags and can be used on clothing. Create a garden focal point. Try using stones, sea glass, glass nuggets or even marbles to create a mandala in the soil in your flower garden. Add a tiny fairy house and miniature furniture to complete the scene. Mandalas made in the soil can also serve as the base for bird feeders and bird baths and create an interesting focal point in the garden. Consider a meandering path of stones that ends at a colorful mandala. Plant a Mandala: If you enjoy gardening, you may enjoy the challenge of planting flowers to create a colorful mandala when they are in full bloom. Sketch your design on paper and then transfer it to the soil using twine or other markers to outline the mandala. If you prefer, you can use stones, pavers or even natural twigs to outline the mandala sections, but this is optional. Vary the color, size and texture of both the blooms and the foliage as you create a repeating pattern to fill in your mandala. Consider multi-colored succulents for your plant mandala. Sand Mandalas: Get the whole family involved when you visit the beach and make a giant mandala in the sand. Challenge little ones to collect shells, stones and sea glass to fill in the mandala. Adults can add miniature sand sculptures or create a 3-D outline of the mandala with sand. Digital Mandalas: If you prefer working with digital images, try your hand at making mandalas from some of your favorite photos. You can either create a collage in the shape of a mandala keeping each photo complete or use manipulation software that transforms an image into a mandala. Working with mandalas can be a lot of fun and can be therapeutic, too. 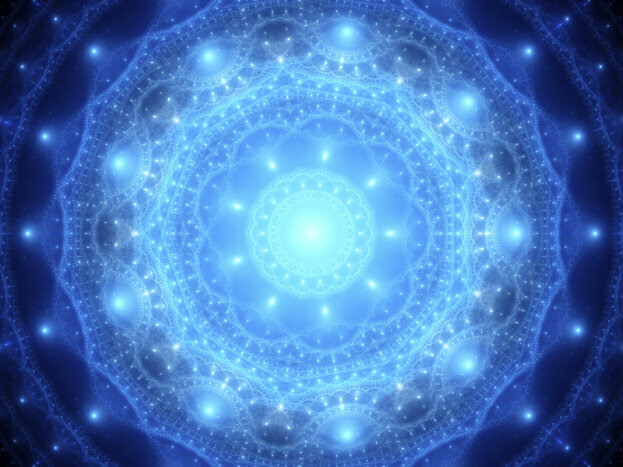 Many believe that you can benefit from mandala therapy simply by focusing on your mandala during meditation. Creating, drawing or coloring mandalas is relaxing and helps to reduce stress.